US Wellness Meats is pleased to partner with Vital Choice Wild Seafood to bring you Sockeye Salmon Burger. 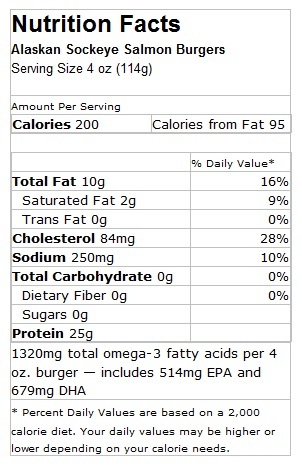 We use our premium wild Alaskan Sockeye salmon and organic seasonings to make these wildly popular 1/4 lb burgers. They’re tasty, healthy and abundant in omega-3s, vitamin D, and astaxanthin. Keep them on hand for quick meals - kids love them too! The July 2008 issue of Prevention magazine picked our Wild Alaskan Sockeye Salmon Burgers as one of five healthy, tasty alternatives to standard, factory farmed beef patties. Vital Choice Sockeye Burgers come individually vacuum-sealed and are best when cooked from frozen, which typically takes less than 10 minutes. Vitamin D3 – About 780 IU, or nearly double the US RDA of 400 IU. Ounce for ounce, Sockeye Salmon provides much more vitamin D3 than any other food. *All ingredients are organic except salmon (wild seafood cannot be certified organic under current US law). **Nutrient levels will slightly vary annually and by harvest location. Each package contains 1 (4 ounce) patty. NOTE: Fish stored in frost-free freezers should be used within 3 months. Great quick and healthy meal! Eight minutes in the pan from frozen gives you a delicious, delicately flavored, moist salmon burger, chock-full of omega 3's! Best of all, my husband likes it too! Fanstastic! Easy to cook! Great taste! Gluten free! Love these! My fave product on this site! Seriously, these have become my favorite product on this site. They are incredibly easy to cook and taste great! Amazing taste. So simple to make. Keep frozen until you're ready to cook. 4-5 minutes in a George Foreman style grill and you're done. Plan on loading up on these next order! These were so easy to cook up (I used my nonstick pan on medium/high; 4 mins max each side). I love the seasoning blend in these, it's not overpowering but still so flavorful. The quality of the salmon shines through with taste, texture, and how good I feel after consuming!